The best way to accomplish that? … a slow boat of course. One night while enjoying dinner in a restaurant in Mae Hong Son, the power dropped out & the entire street was pitched into blackness… the rest of the evening was spent chatting with a couple of other travellers & sharing a few beers, under the flicker of candle light. The power outage turned out to be the catalyst for an interesting evening as we all took turns sharing travel stories from Thailand… and all over the world. Anna & I laid out the details of our motorcycle accident from the previous day – when we visited the local long neck tribe – to much amusement of our new companions. And one of the travellers explained how he had bought an old Enfield motorcycle, rebuilt it by hand, had it shipped to Asia from Australia, & was slowly making his was around SE Asia, China and eventually Afghanistan. interesting. 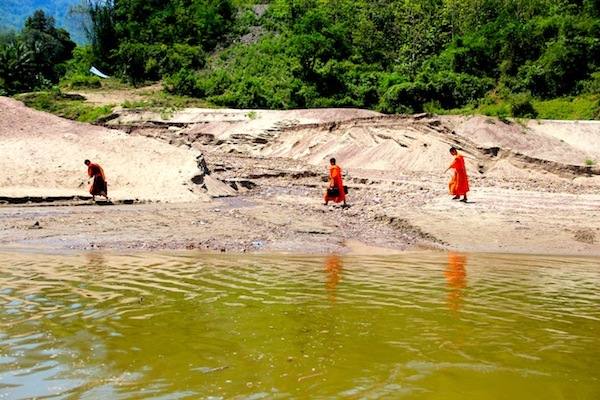 Via slow boat from Huay Xai Thailand (where you can stand on one side of the Mekong river in Thailand and look over to Laos – a stones throw away on the other side of the water) and it was relatively easy to get to via bus from Chaing Mai. We bid our new friends farewell and made plans to head for Huay Xia. Ferried over the river in the morning on a long boat… we threw our luggage onto the muddy river bank & were pointed in the direction of the customs area where we could get our Visa’s to officially enter Laos. 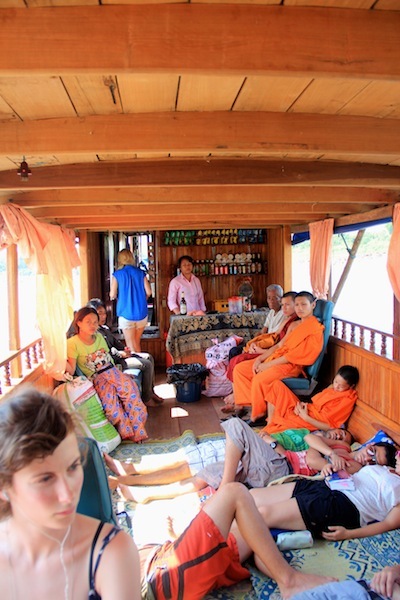 After passing through the customs area, we boarded a second vessel, this one we’d be spending 2 very sleepy days on… taking in the extraordinary scenery of the Mekong river until we reached Luang Prabang. Switching often, from harsh rocky landscapes, to beautiful sandy beaches where young children played, to slash and burn farms where farmers kept a watchful eye over small controlled fires that were sending plumes of thick, grey smoke into the otherwise bright blue sky. … those to slow to grab one of the car bench seats lining the sides of the vessel, found a spot on the floor and rested against the timber walls of the boat or used their backpack as a make-shift pillow and drifted off to sleep. Having a book in your possession was a luxury, if after a few hours the scenery became too repetitive or your neck simply couldnt bear the strain of tuning into the scenery any longer. 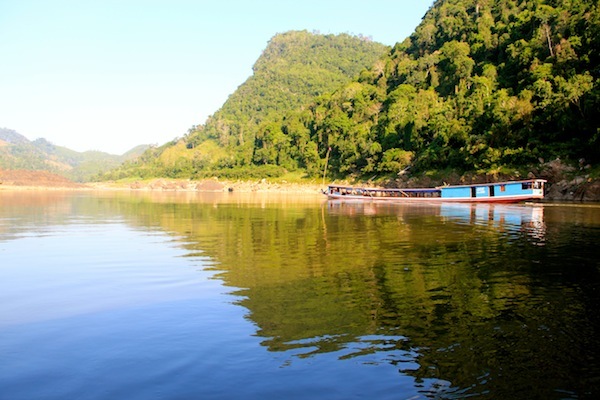 The captain calls it a day and docks the vessel at the sleepy town of Pakbeng, when the sun begins to drop from the sky making the journey to dangerous to navigate around the sharp rocky outcrops that are dotted here & there throughout the river. The second day closely mirrors the first… and as you slowly edge closer to the UNESCO World Heritage Listed town of Luang Prabang, you begin to wish the hours away in favour of dumping your bags in a guesthouse and sitting over a cold beer or warm noodle soup in a restaurant or bar in the cosy little town on the banks of the Mekong river. As the small speed boats scream past, overtaking the slow boats at breakneck speed with white knuckled motorcycle wearing passengers clinging onto the sides for dear life. These boats make the entire journey in 1 day rather than 2, however they look extremely uncomfortable not to mention the questionable safety of the trip. 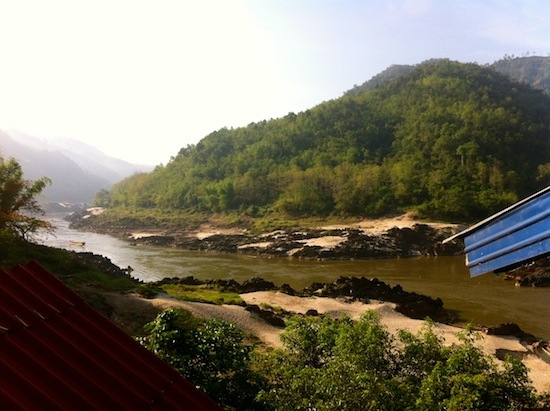 The scenery never dulls even as you draw near Luang Prabang with huge cliffs & sandy beaches presenting themselves after every bend & curve of the river. After recovering our shoes & luggage… Luang Prabang’s centre is a short hike uphill where there’s an abundance of accommodation to rest your weary head for the night. The very next thing you’ll want to do is head over to one of Luang Prabang’s incredible cafes & bakeries. Do you mind if I quote a couple of your articles as long as I provide credit and sources back to your webpage? My website is in the very same area of interest as yours and my users would genuinely benefit from some of the information you provide here. Please let me know if this alright with you. Cheers!